This year’s Superbowl was, well, eventful. Very low scoring lots of people thought it was quite boring. The final score was only 13-3 for the Patriots. So This is my review on this years Superbowl. Let’s start with the losers the Rams. In my opinion the defense was outstanding, I mean holding the Patriots to 13 points is pretty good. The offense, though they were um not so great Jared Goff didn’t play great he was 19-38 with 229 yards and 1 interception, But that 1 interception screwed them up right at the end. The Rams only had 14 first downs in the entire game and they only had 260 yards only offense in total. Their rushing game was mediocre Todd Gurley only had 35 yards on 10 rushes. 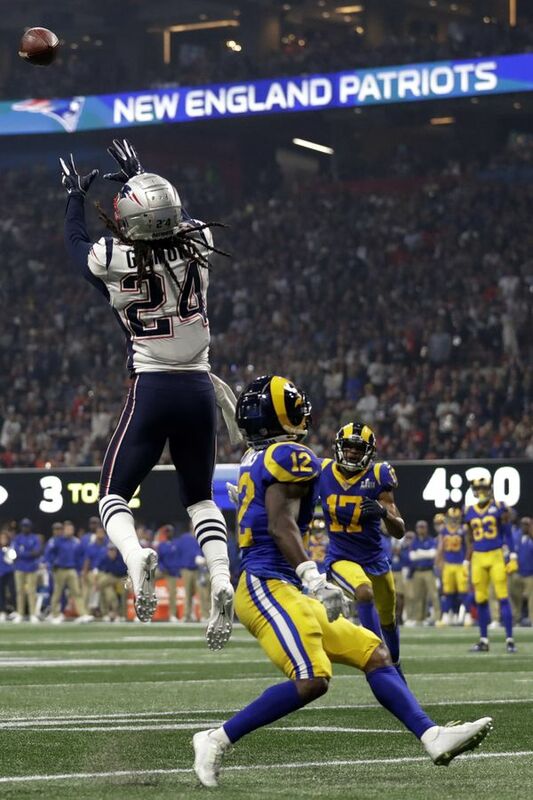 Stephon Gilmore’s interception late in the 4th quarter. Julian Edelman and Tom Brady. Now onto the Patriots, they played pretty well their offense was good, but Julian Edelman played well and he got the Superbowl MVP with 10 catches for 141 yards. Brady played quite well, but the Patriots defense also played great. This years Superbowl was interesting I’m going to give it a (5/10) because the game was pretty boring and the halftime show wasn’t great either.